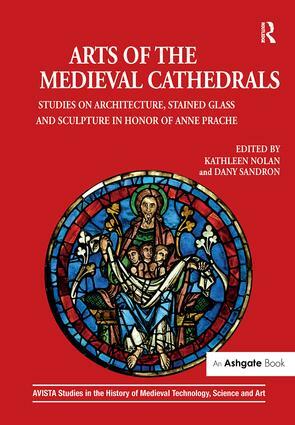 Contents: Foreword, Kathleen Nolan and Dany Sandron; Preface; Anne Prache: a distinctive approach to the history of architecture, Dany Sandron; Introduction, Kathleen Nolan. Part I Architecture: The 13th-century foundations of Notre-Dame de Reims: new evidence for the construction history of the cathedral, Walter Berry; Cathedral, palace, hÃ´tel: architectural emblems of an ideal society, Michael T. Davis; Ambulatories, arcade screens, and visual experience from Saint-Remi to Saint-Quentin, Ellen M. Shortell; Roriczer, Schmuttermayer, and two late Gothic portals at The Cloisters, Nancy Wu. Part II Stained Glass: Stained glass and the chronology of Reims Cathedral, Sylvie Balcon-Berry; Joseph's Dream in the Thomson Collection: reconsidering the reconstruction of the Infancy of Christ window from Suger’s Saint-Denis, Michael W. Cothren; The west rose window of the cathedral of Chartres, Claudine Lautier; Out with the new and in with the old: Jacques Coeur’s Annunciation window and its reception in Bourges Cathedral, Philippe Lorentz. Part III Sculpture: Teachers, preachers, and the Good Shepherd at Reims Cathedral: another look at the radiating chapel sculptures, William W. Clark; The function of drawings in the planning of Gothic sculpture: evidence from the archivolts of the central portal of Bourges Cathedral, Fabienne Joubert; Joseph at Chartres: sculpture lost and found, Charles T. Little; Filiae Hierusalem: female statue-columns from Notre-Dame-en-Vaux, Kathleen Nolan and Susan Leibacher Ward; A little-known work from the 14th century: the faÃ§ade of the cathedral of Lyons, Nicolas Reveyron. Afterword, Gérard P. Prache; Index. Kathleen Nolan is Professor of Art History at Hollins University, Roanoke, VA, USA. Dany Sandron is Professor of the History of Art and Archaeology of the Middle Ages at the University of Paris-Sorbonne (Paris IV), Paris, France, where he is also Director of the Centre André-Chastel.